As a specialist in temperature monitoring, NOVAMED USA provides the most accurate skin temperature sensors designed to fit most incubators and radiant warmers. Choose from a complete range of skin temperature sensors compatible with GE / Ohmeda, Dräger Medical / Air Shields, ATOM Medical and AIRBORNE / Dräger Medical transport incubators / radiant warmers. Specialty thermistor sensor guarantees temperature reading sensitivity with a stable, highly accurate measurement. Molded plug assembly provides a direct connection to the incubator / warmer, eliminating the need for an interface cable. Flexible lead wire facilitates sensor placement directly on the infant for a more precise temperature reading. Reflective, hypoallergenic Mylar adhesive cover provides insulation from external heat sources. Shown Above on the left: 1950 Neonatal Skin Temperature Sensor designed to fit the GE GIRAFFE OmniBed, GIRAFFE Incubators and Panda Infant Radiant Warmers. Shown above on the right, 1930 Neonatal Skin Temperature Sensor designed to fit the GE / Ohmeda Medical Care Plus Incubators and Ohio Infant Radiant Warmers. 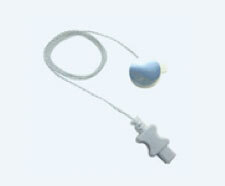 Reusable skin temperature sensors are also available. 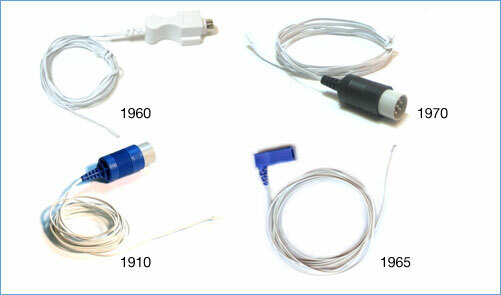 Clockwise from the top left: 1960 Neonatal Skin Temperature Sensor designed to fit the Dräger Medical ISOLETTE C2000 / 8000 and Versalet 7700, 1970 Neonatal Skin Temperature Sensor designed to fit the Dräger Medical/Air Shields Resuscitaire Radiant Warmer, 1965 Neonatal Skin Temperature Sensor designed to fit the Dräger Medical Caleo Incubator and Babytherm Warmer, 1910 Neonatal Skin Temperature Sensor designed to fit the Dräger Medical / Air Shields ISOLETTE. Reusable skin temperature sensors are also available. Shown above on the left: 2000D Disposable Neonatal Skin Temperature Sensor for ATOM Medical Infant Incubators and Infant Warmers. 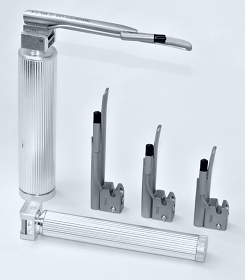 Shown above on the right, the Reusable ATOM Temperature Sensor, 2000R. 1” round replacement mylar disk covers are hypoallergenic, gently adhering to the neonates sensitive skin. Reflective covers provide insulation from external heat sources, giving an accurate reading of the infant’s true temperature. Designed to fit AIRBORNE / Dräger Medical Transport Incubators. Requires 400 Series adapter cables. 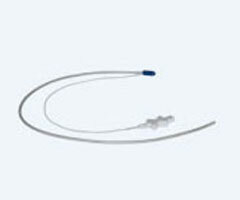 Designed for esophageal, axillary, rectal, or nasopharyngeal placement, to provide continuous temperature monitoring. 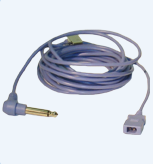 ¼" Right Angle Phono Plug Connection is ideal for AIRBORNE and Dräger Transport Equipment. Requires 400 Series temperature sensors. PN 11-CA-400-12 is 12' (ft) in length. Let us help match your neonatal sensor requirements. Call us at 800-425-3535 / 914-789-2100 or send an email to info@novamed-usa.com. 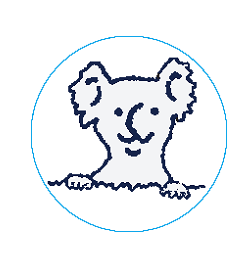 Unlike traditional radiant warmers, KOALA∆T provides conductive underbody warming simulating mother’s natural body warmth. Join us in celebrating those who provide optimal care for the tiniest patients and their families. NOVALITE LED Single Use Standard Laryngoscopes remain cool at all times, the safest option for neonates. NOVALITE LED Standard Laryngoscope blades provide superior illumination with a low profile for safer intubations. Available in pediatric sizes Miller 00 to Miller 1.5, Mac 0 - 1. NOVATEMP Dual Display Temperature Monitor is a portable, battery operated solution for an accurate temperature measurement without a physiological monitor – the preferred choice of EMS, Transport and Pain Management Specialists.